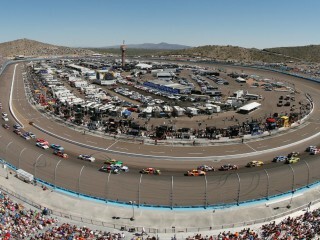 AVONDALE, Ariz. — A mostly pleasant week of weather turned cold, rainy and nasty for NASCAR fans on Sunday at Phoenix International Raceway. 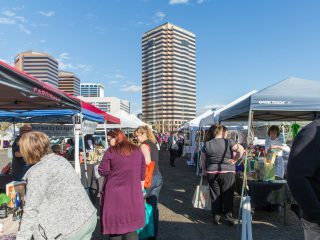 But those fans didn’t hesitate to turn on their propane-powered heaters, take hot showers and fire up their barbecues back at their trailers while attempting to wait out the storms, thanks in some small part to U-Haul, the Official Trailer and Propane of PIR. 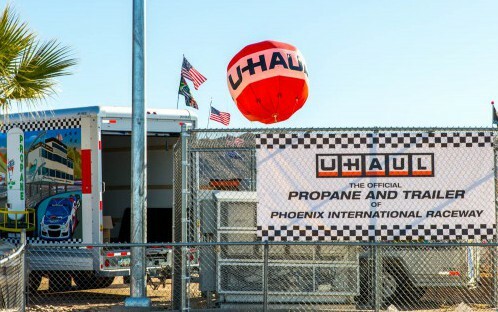 U-Haul had a “great week” of spreading propane awareness and safety tips during NASCAR’s annual fall stop at PIR, according to U-Haul propane program manager John Barnett. The nation’s leading retailer in propane sales filled hundreds of tanks in the process at a special discounted rate, much to the delight of a grateful customer base. 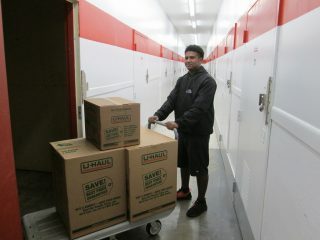 U-Haul Team Members deliver propane-filled cylinders in the Phoenix International Raceway campgrounds during race week. “I definitely think we got our name out there,” Barnett said. 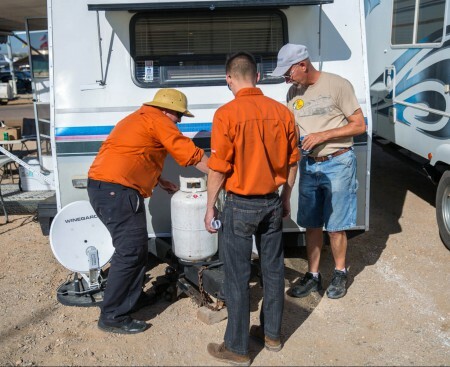 “We had a lot of people asking where they could buy propane in the Valley. I had a lot of people asking where they could by propane in California. 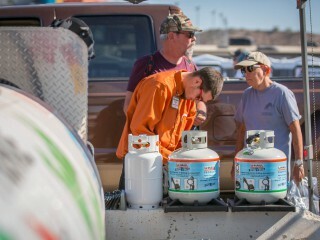 Customers were able to have their cylinders filled at the U-Haul activation site along the Fan Midway, or call a number and have U-Haul Team Members offer free pick-up and return service of portable tanks. Marshel Greenleaf, a propane-certified hitch professional and customer service representative at U-Haul Moving & Storage at 87th and Bell Road in Peoria, Ariz., worked the propane station for two days at PIR and received a lot of positive feedback from racing fans. U-Haul activation area on the PIR Fan Midway. 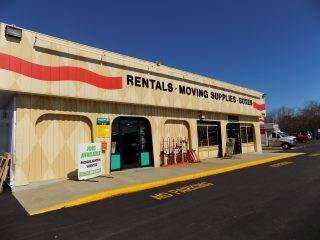 “A lot of people came by saying they really appreciated us, even if people didn’t get the propane at that time,” Greenleaf said. 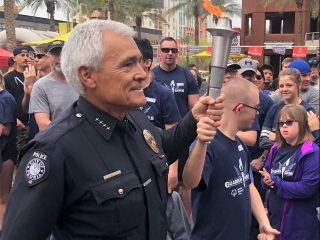 “They’re saying, ‘You guys are a good idea. It’s a good thing that you’re out here.’ Selling new tanks was a good idea as well. We got a lot of the expired tanks out of their hands and got them new tanks, and that helped them out. 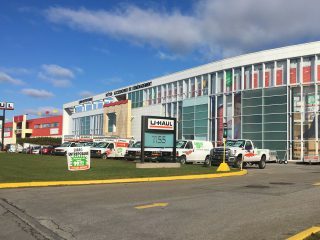 The reward for young racing fans was the opportunity to check out a model of a red sports car swerving back and forth on a raised treadmill in front of the U-Haul activation area. The safe trailering simulator was a hit, offering an easily digestible lesson for persons of all ages. The simulator, comprised of a one-tenth-scaled model with small weights attached at two spots behind the car to represent a trailer’s weight, showed how a vehicle could sway uncontrollably if loaded improperly with more weight in the back than front, especially at a high rate of speed (simulated by the treadmill). The U-Haul Safe Trailering Simulator is showcased during a media segment at PIR. 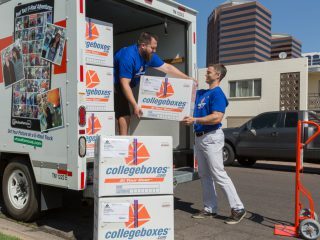 Fait noted that U-Haul has shared its safe trailering instruction through its driver’s education program and written materials, but the simulator brought it together in about 20 seconds. In case you were wondering, Dale Earnhardt Jr. won the rain-shortened Cup race on Sunday night and Kevin Harvick, Kyle Busch and Martin Truex Jr. joined Jeff Gordon as the foursome who will compete for the Sprint Cup championship at Homestead-Miami Speedway on Nov. 22. 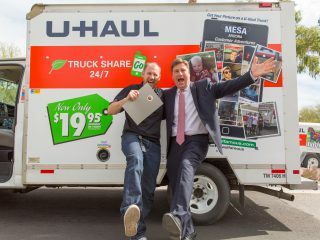 Thanks to our customers, NASCAR fans, Team Members and PIR for making U-Haul Company’s initial partnership with the raceway a success.